my life is full of blessings, I am grateful. Bangkok is a megacity on steroids. With more than 9 million residents, the city does not stop. I was fortunate enough to visit Thailand this October. What made the trip special was that I was returning after having lived in Bangkok in 2012. During my junior year of undergrad, I studied abroad in Bangkok and completely fell in love with this intoxicating city. At the time, I decided to extend my stay beyond my academic duties and secured a job as an English teacher. This gig allowed me to extend my time in Bangkok, and blessed me with the opportunity to travel throughout the rest of the country. my BKK crew!! Circa 2012. Fast forward to 2017, Bangkok continues to expand and grow. The city I knew in 2012 has now grown even more so as tourism continues to expand and Thailand solidifies its economic importance in Southeast Asia. Bangkok will forever hold a special place in my heart and I am forever grateful for its openness, warm people and rich culture. I was craving some Western style coffee when I stumbled upon Broccoli Revolution. A vegan safe space, Broccoli Revolution offers a unique experience in the midst of the busy Thong Lo neighborhood in Bangkok. With vegan dishes especializing in Thai, Burmese and Vietnamese cuisine, Broccoli Revolution offers a vegan take on items like pad thai and other popular dishes. I ordered a coconut milk latte and sat to enjoy the quiet ambiance of an otherwise busy day. Broccoli Revolution has a beautifully lit decor and space where expats take away a taste of New York City, Amsterdam or maybe even Paris. You may forget for a minute that you're smack dab in the middle of Southeast Asia while visiting this urban gem! After more than 18+ hours of travel, a Thai massage was deff in order!!! I snuck a quick selfie pose in my robe minutes before my appointment at Health Land Spa and Massage in Sathorn, Bangkok. The spa's Four Hand Massage is a masterpiece. Four-hand massage involves two therapists working simultaneously to create a choreographed massage experience. Originating from ancient Ayurveda, the dynamic flow of two massage therapists working together in harmonious synchronicity is an experience that is difficult to match. Whether you want to splurge a bit or not break the bank, Bangkok's array of massage offerings are plentiful! You can get a 1-hour full body massage for as little as the equivalent of $5 U.S dollars! My partner E. in one day booked two massages, LOL!!! We arrived in Bangkok in quite an interesting time. 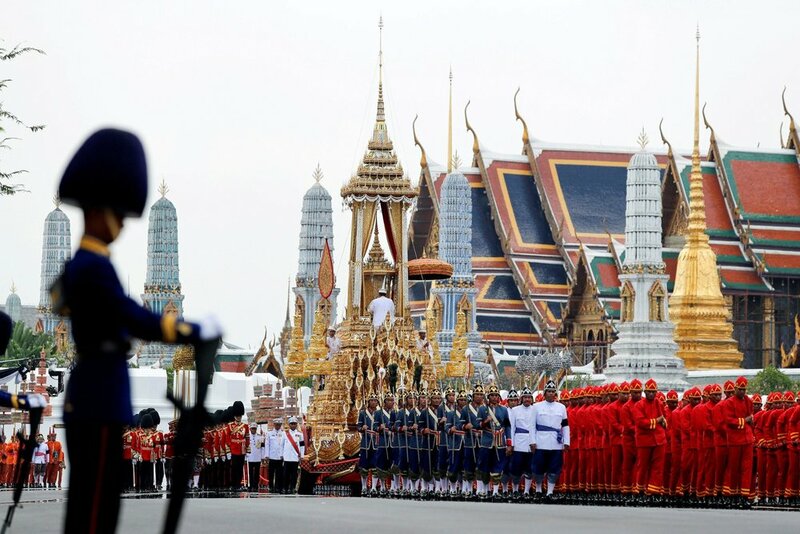 In late 2016, Thailand's beloved King passed away after serving a lifetime commitment as monarch of the great kingdom. The Great Majesty King Bhumibol Adulyadej served as Thailand's monarch since 1946 until his death in 2016. The death was marked with a revered year of mourning nationwide. During our visit, we experienced the culmination of this event as murals around the city were commemorated in his honor. Featured above are recreations of real-life portraits cemented into modern art pieces displayed throughout Bangkok. The Great Majesty King Bhumibol Adulyadej final cremation was completed 1 year after his death during the final week of October. The solemn event was marked in opulence to commemorate the passing of a King loved by his people. Celebrations around the world also commemorating the event as more than 10 cities worldwide held their own memorials. Due to this fact, we were unable to visit the Grand Palace as the structure was closed to honor the upcoming ceremonies. Navigating Bangkok involves patience, flexibility and overall just being able to go with the flow. The city's traffic is overwhelming! A rush of cars, motorbikes, tuk-tuks (Thai's local taxi) make their way downtown minute by minute, hour by hour. With an increasing population, tourism at its highest peak in years, Bangkok is a megacity with lots happening all at once. Think of New York City 10x over!! One way Bangkok has begun to solidify itself as an urban metropolis is through its Skytrain. By offering an escape from tumultuous traffic, the BTS Skytrain allows you to reach your stop without fuss above the city therefore escaping the heinous daily rush hour. There are two BTS Lines : SILOM Line runs west to south, between the National Stadium in the Siam shopping area and Bang Wa in Thonburi (across the Chao Phraya River). The Sukhumvit line runs north to east from Mo Chit to Bearing. The two lines meet at Siam Station, and also connect at two points with the underground (MRT) – at Sala Daeng Station (Silom Line) and Asok Station (Sukhumvit Line). A new train arrives every 3 - 6 minutes or so between 06:30 and midnight. The fare is very affordable at the rate of less than $1 USD each way. rush hour: BKK style. Bangkok, Thailand. I hope Bangkok continues to invest in this critical infrastructure as the city deals with increasing pollution and traffic gridlock. Offering residents an alternative through efficient public transport would greatly benefit the city and country as a whole. Thinking about sustainable transit options, the BTS Skytrain represents what the future of transit can look like when cities invest in smart + modern technology. Through its efficient service, the BTS Skytrain is helping Bangkok solidify itself as an urban mecca. Thai cuisine is unparalleled. During my original stint in Bangkok, I lost more than 15 lbs! This can be explained through the fact that Thai cuisine is heavy in spices, and an array of their dishes are heavily laden with vegetables. I enjoyed EVERY.SINGLE.MEAL. on this trip! I am still craving the delicious tom yum koong we enjoyed on this evening! The soup has a coconut milk base and is filled with mushrooms, shrimp and all kinds of spices. I love this wrap skirt because I have literally worn it as a beach maxi, or shown up to the club with it as I did on this night! I paired it with a black bodysuit + large yellow earrings all from ZARA. BKK nightlife is also unparalleled. Clubs throughout Bangkok offer anything you are looking for: hip-hop, trance, salsa, punk... you name it! We visited Maggie Choo's for Bangkok's Model Wednesdays (this is a night where models in the city go out and get free drinks- its so LIT), and Sing Sing Theater, a dizzying nightclub with acrobatic dancers swinging until the wee hours of the morning. Bangkok also has a lively speakeasy scene. In these cases, you need to know a local to get you around + in to these coveted spaces. Once you got a plug though, get ready for a whole other side of BKK not known outside of its metro! Its what I love most about Bangkok: you never know what you might get into! You just gotta be ready for whatever comes! My obsession with tom yum goong is unreal. The soup is a staple of Thai cuisine. The broth has even been credited with curing cancer! an array of delicious spices x flavors. truly a masterpiece! This beautiful monk shared some amazing insight with me regarding the structure of Wat Arun. Here you can also see a closer look at the architechtural design representing the guardian gods. Buddhism is an important part of Thai culture, and these structures are an ode to the history of Buddhism in Thailand and its continued presence. The magnificent structure of the Reclining Buddha is presented inside Wat Po in Bangkok. The iconic structure represents the historical Buddha during his last illness, about to enter the parinirvana. Parinirvana is commonly used to refer to nirvana-after-death, which occurs upon the death of the body of someone who has attained nirvana during his or her lifetime. The Reclining Buddha, Wat Po, Bangkok, Thailand. The structure was truly awe-striking. Upon exiting the structure, local monks were beginning to assemble for their evening processions. does my sassiness upset you? After a few days in Bangkok, we headed to the south of Thailand. Krabi province is a gorgeous sight with over 100 islands on its coast. 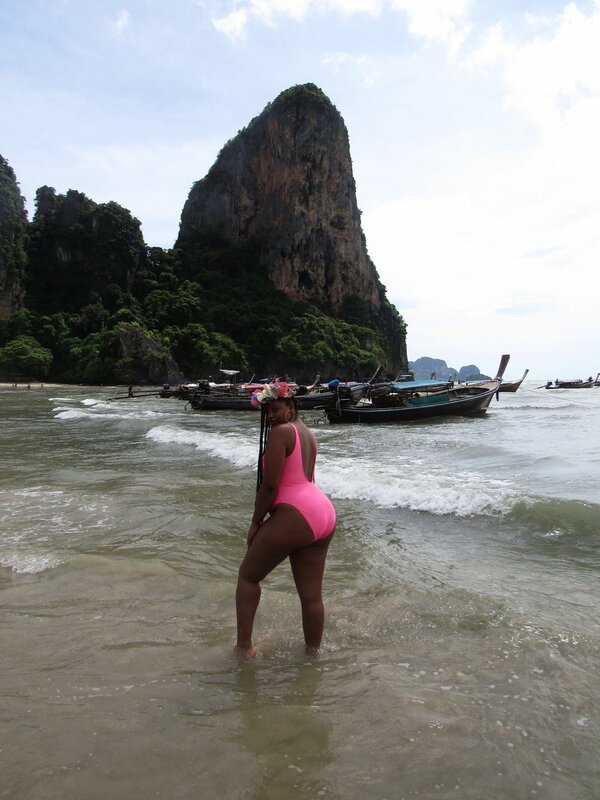 We decided to visit Phi Phi Islands (famous for its Maya Bay portrayed in the film "The Beach"), and Hong Island. The sights were unbelievable and we often felt like it was a scene out of a dream. Unreal vibes + atmosphere! Thailand will forever hold a special place in my heart thanks to its rich culture, humble people + amazing food. I feel so blessed to have had the opportunity to return to the country that I credit with helping me become a more well-rounded woman and share the experience with my beau. Bangkok in particular is an unforgettable city with so much character and depth. 2017 has afforded me the privilege of travel + I hope I inspire others to pursue their passport dreams. Happy to share my travel experience! Peace + Blessings.